Julieanna will provide the music at Daisy’s Café at Todmorden Health Centre Saturday, August 4th. 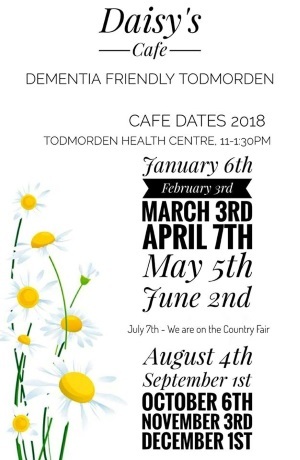 The café is on from 11am until 1.30pm and is run by Dementia Friendly Todmorden. Everyone is welcome, and the group will be offering their usual support, advice and information for people affected by dementia along with their families and carers. As well musical entertainment, the café will be serving soup and sandwiches with coffee and juice for £2.50, or drinks and biscuits for £1.50. This entry was posted in Health & Wellbeing on July 19, 2018 by calderdaleforum50plus.